The Knitcoin Edition (2018), Ebru Kurbak. Installation. Paper, wood, wool. The Knitcoin Edition is a material commentary on the current human condition shaped by the recent accelerated market valuation of cryptocurrencies. Manual labor and economic value have been in a constantly changing relationship throughout the history of humanity, from the time when people who lived along the Silk Road used textiles as currency (literally “making” money through tediously brocading and hand-weaving silk), to the rupture created between the two by immaterial money markets dominating the world of finances. Emerging cryptocurrencies, shadowed by the justified thrill they create with the promise of decentralized structures, are further transforming this relationship. A human condition that is perceived to be new has arisen from the delegation of the making of money to the computer by “currency mining,” while the investors themselves are immersed in the continuous monitoring of trading charts. The Knitcoin Edition is an intervention in the well-known board game Monopoly to evoke speculation on the implications of this type of pseudo non-labor, which in some aspects has come full circle to the ancient practice of being invested in the laborious making of the currency itself. The proposal is to replace the game’s paper play money with “knitcoin” without changing the rest of the rules. When players need play money, they must knit it. The installation invites the audience to speculate on the consequences of such a system. 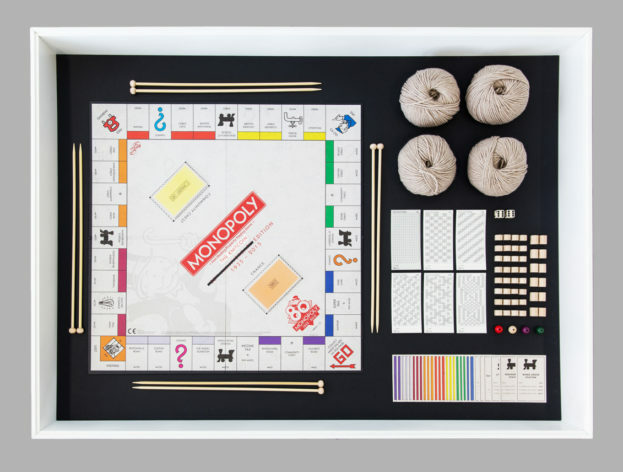 Monopoly is proposed intentionally as a self-reflexive component, since the game itself was originally invented as a critical tool to demonstrate the unfair consequences of the system it now iconically represents.